Assassin's Creed is a lot of things: blockbuster entertainment franchise, beautiful open-world murder simulator, inspiration for rock climbers the world over. "History textbook" doesn't seem like it would be at the top of this list. 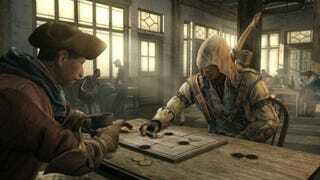 Even its dearest fans will admit that Ubisoft's series takes creative license to stray from historical fact. Nicolas Trépanier, a history professor at the University of Mississippi, doesn't think that Assassin's Creed gets enough credit in this regard. Writing in this month's issue of Perspectives On History, a magazine published by the American Historical Association, he takes issue with the standard charge that games like Assassin's Creed can't properly educate their players since they're often rife with historical inaccuracies. Trépanier counters this by saying: yes, Assassin's Creed isn't necessarily "true" in the strictest sense of the word. But that doesn't make it any less useful as an educational tool. If anything, erroneous details help to spur further investigation. Yes, "historical" video games are filled with inaccuracies. Yet more than a limitation, these inaccuracies can serve as a pretext for discussion. For example, what factors, beyond sheer ignorance, caused these inaccuracies in the first place? How do various cultural influences, such as the conventions of cinema, shape the way in which they present history? How do they relate to ethical and commercial considerations? It is rather striking to see how far, for example, the creators of the original Assassin's Creed went to remove any religious contents from a game inspired by a group that an earlier generation of historians presented as Islamic terrorists. Indeed, merely raising these questions often pushed classroom discussions toward the relationship between these inaccuracies and ongoing historiographical debates—for example, by looking at how scholars today criticize older scholarship on the Nizâris and by trying to identify the historians whose works might have guided the choices of game designers. By the time he was done with the course, Trépanier goes on to say, "the students had become keenly aware" of a core issue in studying and writing history: nothing is ever truly settled. One shouldn't compare a video game to "real, ­objective history." Rather, the player should measure the game's veracity compared to "the constantly debated and sometimes contradictory outcome of historiographical research." "This seminar therefore ­succeeded," Trépanier concludes, "more efficiently than most undergraduate courses, in bringing students closer to the work that historians do, not just as teachers, but also as scholarly researchers." In other words, Assassin's Creed is the best kind of history book: one that doesn't simply dole out facts and figures for the reader to memorize, but instead invites them into its world to poke and prod at the nuances of doubt and obscurity.